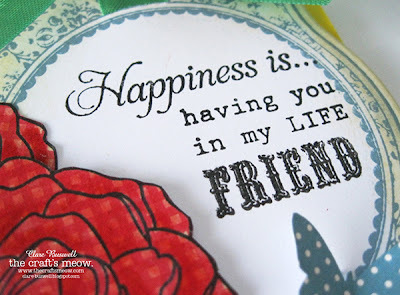 Welcome to The Craft's Meow April blog hop! The theme this month is 'Friendship'. I used some of my favorite TCM stamp sets on this one, Happiness Is... (because I just love flowers! ), Lovely Labels 18 and Cherished. I stamped the flowers and leaves from the Happiness Is... stamp set onto some patterned paper and added some shading to the flowers with Distress Markers. The label from Lovely Labels 18 I stamped using VersaMagic Aegean Blue ink and inked the edges with Distress Ink. The sentiment is a combo from Happiness Is... and Cherished stamp sets. The butterfly patterned paper is from October Afternoon (Woodland Park) and I die cut it using Spellbinders Romantic Rectangles. The little butterfly I cut out from the patterned paper. Next up on the hop is the lovely Deborah Nolan. 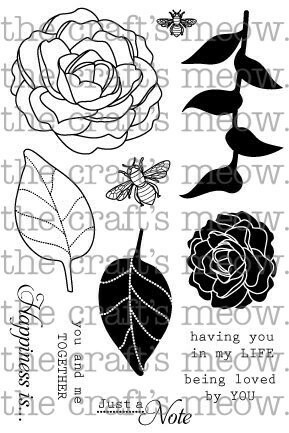 Visit The Craft's Meow Blog for the full list of participants. Enjoy the rest of the hop and have a great day! 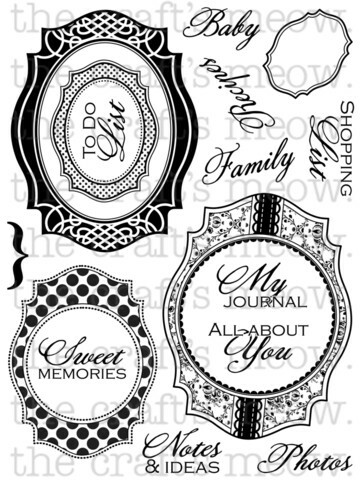 Here are the stamp sets I used on my card today. Wow, this is so beautiful. Love the flowers and the colors and the brilliant design. 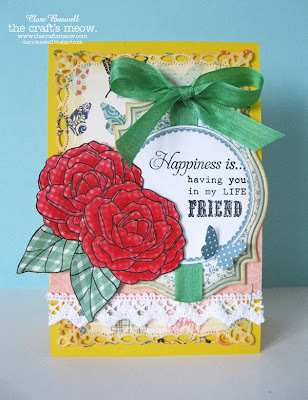 Gorgeous card, great use of these stamps! love the card. I always love the effect of stamping on patterned paper but haven't tried it yet but your card makes me want to go now and try it! Very pretty--I like the patterned paper you used to stamp on. I love friendship cards. We should make them more often. The flower stamped on patterned paper is so pretty! Sooo lovely Clare! Love those flowers! Beautiful card! Love that the roses are on patterned paper. Really lovely, Clare! A great mix of stamps! Gorgeous card! I love all your layering, layout, & stamps you used! Beautiful card - love all the layers, papers and the stamps are gorgeous! 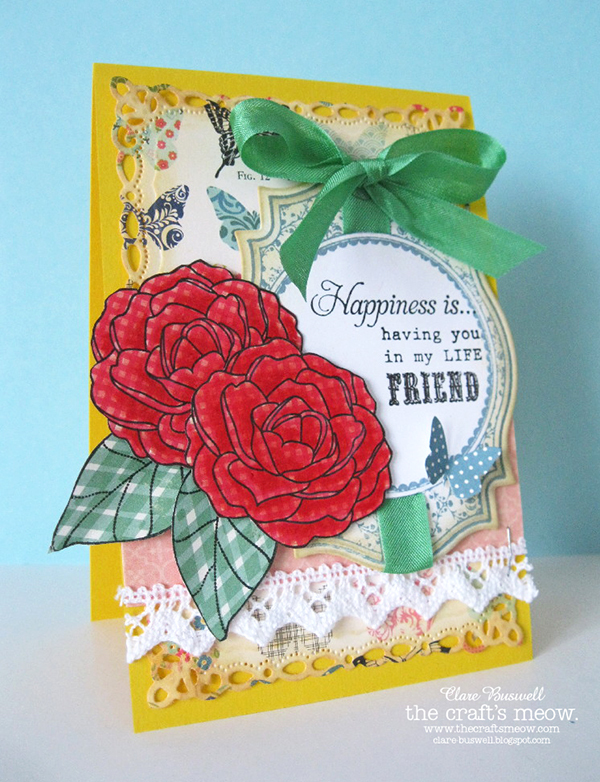 I am loving the design of your card and all the different elements and stamps that you used! this is a lovely card! The flower stamp is gorgeous. You did a great job on this and I love the lace strip. Just the right touch. Love the pattern paper roses. Beautiful! Such wonderful rich colors and fabulous layers! TFS! This is awesome!! I LOVE the paper pieced flowrs and leaves!! Looks so fantastic!!! absolutely gorgeous!! ohhh love those flowers and the designs you've put together! Wonderful card...love the stamping on patterned paper. Great card. 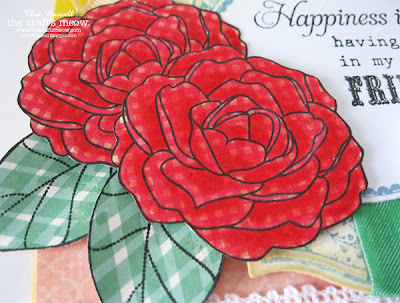 Love the stamps and the beautiful roses. 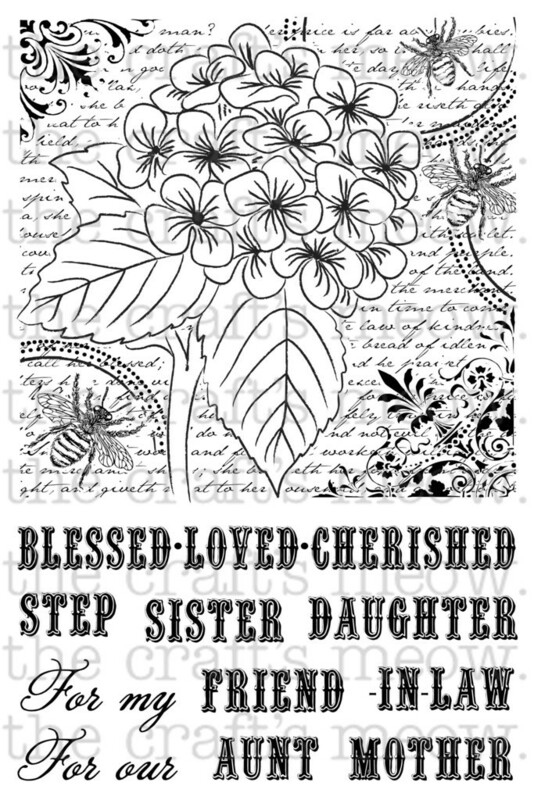 Stamping on patterned paper created such a beautiful effect. Love your card. I love the vibrant flowers and that seam binding! So pretty! Loving those big red flowers! This is a beautiful card. I love the that you stamped and inked the pattern paper. Love your touched-up paper pieced flowers! Gorgeous card! Great idea to stamp on gingham. It looks really cute. What a pretty card. I especially like the roses and leaves on the gingham paper. It's beautifully layered, too. That is one delightful card! !